For those who don't know the whole story. more than one "Steve" founded Apple. 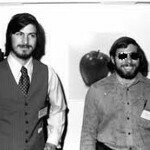 In 1976, boyhood pals Steve Jobs and Steve Wozniak started Apple Computer from a garage, selling do-it-yourself kits to build home computers. Back in 1977, the company delivered the Apple II and started on the path it took, to make devices that people would find innovative, intuitive and impossible to live without . Wozniak left Apple in 1985 for other pastures (including a short voice over stint on the animated "Code Monkeys"). Steve Wozniak was long gone from Apple when Steve Jobs made his triumphant return and the company released a string of hits that hasn't been topped yet (and might never be): The Apple iMac, Apple iPod, Apple iPhone, Apple iPad all became big hits from the moment each was launched. The devices changed the landscape of the business that they were aimed at. In a brief interview with the Associated Press, "The Woz" recalls how in the early days, he handled the engineering side of things while Jobs was the business guy. We're sure that both Steves could not imagine the impact that their little company would end up having on the world. And with the untimely passing of Steve Jobs at 56, in some ways it is up to Steve Wozniak to continue to remind everyone that it is possible in America for two young kids to start a business in a garage and with some innovative ideas and new products, turn it into a multi-billion dollar powerhouse whose devices have changed the world for the better. Truly is an amazing story. Love that pic, by the way. Everyone looked like a pimp or stoner back in the 70's. LOL. Hey, Legos are awesome. Great way to get your kids to grow up to become engineers and architects. And I loved my Casio calculator watch! that was sad at the end when he started tearing up.... they were close. They built the foundation of what was once the world's most valuable company together. They werent just business partners, they were really good friends. I tipped this :). This must have been really hard for the woz to do. I wonder if steve and his biological dad every talked at the end of his life. how did you know that he didn't like m*sl*ms? on the worldwideweb of course... search on the google... jobs go find his sister and mother knows about his father, but never go to him. he know that his father is a m*sl*m he know that his grandfather (from mom side) hate that man it didn't written explicitly as that, but it were written implicitly. (and most non-m*sl*m, although might have some of m*sl*m good friend, doesn't mean they like their friend faith. because m*sl*m faith were too brutal). ...because m*sl*m faith were too brutal). Hopefully you are not 2-time brutal by saying that. And what the hack are you starting to talk about someone's religion in this post!! because I'm non m*sl*m who live in a country that were dominated by m*sl*m. and although i have many good m*sl*m friend. they all brutal when talking about faith. for example, i never force them to eat pork, but they all want to ban pork selling because they don't eat it.... the point is, they always want to force non-m*sl*m to be m*sl*m, that's why i said they were brutal. when in my area want to build church, they were angry like crazy, throwing stone to non-m*sl*m house. if they were really peace loving, there would be some of them would prevent this... in reality, even the one that not violent, just watch the non-m*sl*m house being thrown with stone. so, living in a country (non m*sl*m country) that were dominated by m*sl*m is like HELL. I never eat pork in front of mu***, i know this would make me behead me. I live in Indonesia... bogor... I'm a native indonesian... dark skin... not an outsider. but my parent sent me to catholic school, as catholic school provide better education compared to mu*** school in my country. there were a couple of m*** movement lately in my city. They would like the city of bogor to forbid the sale of pork, just because they don't eat it. It's so unfair. They intimidate the pork seller. so right now the only way to get pork is in other city. and we (the catholic) would like to build new, bigger church, and the m*** don't like it. They throw stone into our house. and intimidate anyone who would sign a petition to agree for the church. They force us (even the catholic) to sign the petition against it. and i know... in every country that m*** is a dominance... this kind of tragedy is not uncommon. so, i believe steve doesn't like his dad too because of this. reply II. If I'm native in saudi arabia and non-mu****, and want to make church, do you think it's allowed? do you think there would be any m****m that would bravely said, that the non-m****m also have the right of their own church??? ..... you'll know why i call m****m crap when you answer this.... peace loving??? nice people??? not really!!! Owh wait..thats remind me..THIS WEBSITE IS ABOUT PHONES AND TABLETS!! What's your point bring up this matter?? A**Hole! Your Welcome, I believe you know steveo said the truth with that anger. You really show a true face of being m*sl*m. :) If you were a wise and peace loving person, you will understand what steveo said and change your faith to something that didn't do injustice to others. R.I.P Steve you were simoly one of the best(if not the best) CEOs of all time. Btw,steveojobo,where are u from ?